In 2008, the Ranney family of Nantucket installed a 2.025kW PV Solar System to produce their own electricity and to lower their utility bills. Over the last three years it has proven to be a successful renewable energy application on Nantucket. For more information about this system, DOWNLOAD the case study! Are you a Nantucket Energy Leader? Net Metering is a state regulation allowing customers to receive value during periods when their eligible on-site distributed generation (such as a wind turbine or solar array) generates more electricity than they use. 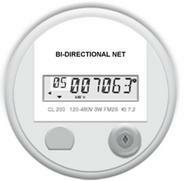 That is, the electric meter runs backward whenever a customer’s net-metered facility is producing more power than is being consumed and their account gets net-metering credits for net excess generation at the end of the customer's monthly billing period. Net metering has been an important program especially for supporting development of municipal solar PV facilities. Through the net-metering program, facility developers can arrange to sell the electrical output of their solar PV facility to a creditworthy entity (a town or municipal entity) under a long-term contract at a favorable price to the developer that provides substantial savings to the municipal entity. The contract then provides revenue support for debt financing of the facility. Each Massachusetts distribution utility has a cap on the amount of electrical generating capacity that is eligible for its net-metering program. Currently, the cap for municipal projects is based on 5% of the utility's historical peak load. One problem faced by almost all municipalities, however, is competition for eligibility under the cap with other municipal projects in the same utility service area. The net-metering program has been so popular, that the capacity of the projects being developed can exceed the cap on eligibility. Nantucket does not face this risk. Although Nantucket is served by National Grid, the Massachusetts DPU has made the interpretation that the net-metering cap for the National Grid subsidiary that serves the island, Nantucket Electric, is separate from the net-metering cap for National Grid's subsidiaries on the mainland (Massachusetts Electric). Thus, Nantucket's entire cap for the net-metering program is available for use by the public and private sectors without competition from solar PV projects in any other Town. ​The Energy Office is committed to promoting green jobs on Nantucket, engaging Nantucket-based contractors, and keeping the work local. On January 19, 2012 the Nantucket Energy Office coordinated and hosted a contractor informational session, with representatives from National Grid and their lead vendor, CSG, to educate local Nantucket businesses on how to participate in the Mass Save home energy services program by becoming qualified Home Performance Contractors and Independent Insulation Contractors. More than 30 interested local participants attended. The Energy Office continues to work with National Grid and local contractors to get local businesses involved in providing energy conservation and weatherization services on Nantucket through the Mass Save initiative. A repeat informational session is scheduled for October 9, 2013. ​On May 7, 2012 the Nantucket Energy Office sponsored a small sit-down dialogue with local heating and cooling contractors who provide geothermal and heat-pump services and products on Nantucket. Together we discussed how the Town can assist in promoting such products/services to the community. We also work towards supporting Contractor education by teaming up with the Nantucket Builders Association to host an "Energy Code" Education series. The Town of Nantucket has a particular interest in the development of new and emerging pyrolysis technology for converting waste plastics into liquid fuels. The Town is responsible on an ongoing basis for managing large quantities of waste plastics have been generated on the island and for which there have been limited alternatives for beneficial re-use. Technology that uses waste plastics as a feedstock could reduce the costs and burdens of managing waste plastics at the landfill. Moreover, without natural gas service, Nantucket relies heavily on imported liquid fuels for transportation, space heat and other purposes. Production of liquid fuels from waste plastics available locally, would reduce the island’s reliance on imported liquid fuels, and would reduce the environmental impacts associated with fossil fuel use. In this context, the Town is actively seeking a developer or vendor of an emerging technology for conversion of waste plastics to liquid fuels with interest in developing and operating a facility on the island. The Town could provide space for such a facility at the site of the Town’s landfill; make available supplies of waste plastics; and facilitate arrangements to use the liquid fuel products locally. This project is at its initial planning stages, and faces many challenges, but could provide substantial benefits to the island if completed successfully.